When a battery offense is committed against a peace officer or other official, the defendant would likely be charged with battery on a peace officer in violation of California Penal Code Section 243(b) PC and California Penal Code Section 243(c)(2) PC. This is considered a significantly more serious crime than simple battery. Prosecutors tend to take these cases very seriously and often seek harsh punishments for those who are convicted of this offense. However, there may be situations where this offense was committed accidentally or where the officer in question has exaggerated the defendant’s conduct. In these cases it is critical to retain a skilled Los Angeles criminal defense attorney who does not shy away from challenging the police. In order to convict a defendant of battery on a peace officer, the prosecutor would have to establish that the defendant willfully and illegally made physical contact with another person in a harmful or offensive manner, that the other person was a peace officer or member of another protected class who was performing his or her duties and that when the battery was committed the defendant knew or should have known that the victim was a peace officer or member of another protected class engaged in performing his or her duties. The prohibitions under California Penal Code Section 243(b) PC and California Penal Code Section 243(c)(2) apply to peace officers as well as a number of other professionals, including firefighters, emergency medical technicians, probation employees, doctors or nurses providing emergency services, lifeguards, jail or prison guards, process servers and a number of other officials. The “battery” does not have to involve serious injury or harm. The law only requires intentional physical contact that is considered offensive or harmful. For example, a process server is attempting to serve a legal summons on a man in a divorce case who is trying to avoid being served. The man sees the process server approaching him while he is leaving the grocery store. The man throws a bag of groceries at the process server and then attempts to run away. The bag bounces off the process server and does not cause any injuries. This man could be charged with battery on a peace officer in violation of the law. There may be a number of defenses that a defendant can assert if he or she is charged with battery on a peace officer. To be criminally liable, the defendant must have known that the victim was a peace officer and was performing his duties. This means that if a man gets into a fight in a bar with another patron and learns after the fact that the other man was an undercover detective, the man would not be guilty of battery on a peace officer. He could still be charged with simple battery in violation of California Penal Code Section 242 PC. In addition, this offense requires that the defendant willfully and intentionally committed the battery. There may be instances where there is a significant amount of incidental contact with a peace officer, especially where the officer is attempting to arrest or move a suspect. The arrestee may move his or her body and unintentionally come into contact with the arresting officer. In these cases, the defendant would have a strong accident defense if charged criminally with this offense. Battery against a peace officer is usually a misdemeanor offense and those convicted can be sentenced to serve up to a year in jail in addition to expensive court fines. If the victim suffers an injury as a result of the battery, the defendant can be charged with either a felony or a misdemeanor. If charged with felony battery against a peace officer, the defendant can potentially be sentenced to up to three years in prison. 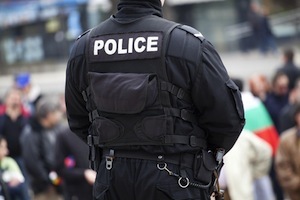 If you have been charged with battery on a peace officer, it is important that you consult with a Los Angeles Criminal Defense Lawyer immediately. As a former Deputy District Attorney with over 14 years of prosecutorial experience, Los Angeles Criminal Defense Attorney Michael Kraut understands that these cases can often be very sensitive and is highly reputed throughout the court system as a strong advocate and skilled litigator. For more information about Los Angeles battery on a peace officer offenses, and to schedule your free consultation, contact Los Angeles Criminal Defense Lawyer Michael Kraut at the Kraut Law Group located at 6255 Sunset Boulevard, Suite 1480, Los Angeles, CA 90028. Mr. Kraut can be reached 24/7 at 888-334-6344 or 323-464-6453.